Pour entire bottle of barbecue sauce into crock pot. Stir in can of root beer. Then mix in the onion soup mix and add salt and pepper to taste. Add the roast, and cook on low for 8 hours. When fully cooked, shred pork with a fork and stir throughout the sauce mixture to ensure all of the meat is coated. 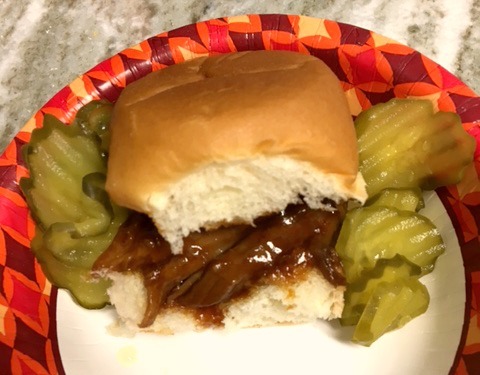 Then place mixture onto a King's Hawaiian roll or bread and top with pickles and onions for a delicious barbecue sandwich. This recipe is also good on a baked potato. **Note; For a leaner version, try using a pork tenderloin.